Don’t get me wrong. I think the Sharks are the biggest, most overrated bunch of underachievers (the double whammy) that the NHL may ever have seen. But this is their year. This will be the Sharks’ first trip to the Stanley Cup Final. Here’s why. This season, with 113 points, they won the Pacific Division for the third successive year. It was the fifth time, over the past six seasons, that San Jose has eclipsed the 100-point mark. And throw in one Presidents’ Trophy, in 2009, as the league’s highest point-getters in the regular season. But this year, there are specific differences between this and previous Sharks’ entries. First, their top line of Joe Thornton, Dany Heatley and Patrick Marleau finally gets how it works. And that’s because they watched the whole deal unfold in Vancouver at the Olympic Winter Games. There is absolutely no substitute for experience. And there is no experience in hockey like the gold-medal winning experience. And, don’t forget, Sharks’ defenceman Dan Boyle also sports Olympic gold around his neck. These Canadians saw, from the inside, how much dedication and blood and sweat are required to win. Not just contend…win. Although that top line accounted for 254 scoring points (roughly 36% of the team’s total scoring), they are no longer simply a one-trick pony. Centre Joe Pavelski scored 25 times. RW Devin Setoguchi fired 20. And LW Ryane Clowe scored 19 times, while pounding opponents with 131 penalty minutes. 40-year old defenceman Rob Blake, the owner of a 2001 Stanley Cup ring (in Colorado) and a 2002 Olympic gold medal, will be invaluable. And Dan Boyle (the fourth highest scorer on the club) keys the power-play blueline. Now, I have never been an Evgeni Nabokov fan. 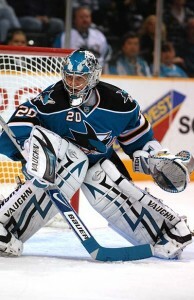 But, entering the 2010 SC Playoffs, the 34-year old netminder has 65 games of postseason NHL experience. That’s more than any other team’s starting netminder not named Martin Brodeur. Nabokov’s gotta start figuring out how this works sometime. It will be this time. Of course, head coach Todd McLellan still has to push all the right buttons. And they must remain relatively injury free. But this will be the Sharks’ spring – finally. In the Stanley Cup Final, they’ll play the Pittsburgh Penguins. It will be the absolutely ideal marquee match-up for the NHL. It continues to build the California hockey fan base – just as the 1993 Los Angeles Kings and 2003 and ‘07 Ducks did. And it again puts Sidney Crosby in the spotlight – something all hockey fans and teenage girls can’t get enough of. So, keep your eye on the Sharks. They have all the pieces. Now they just have to execute. Same as always.